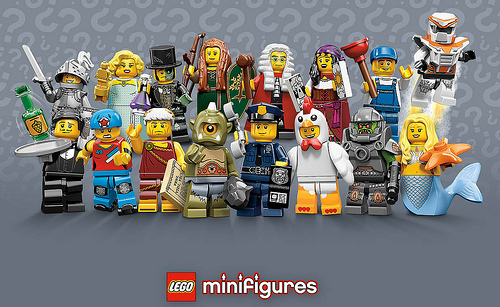 Series 9 minifigures revealed and reviewed! Lego has done a good job keeping pictures of series 9 minifigs from leaking out, so for the first time we see a simultaneous reveal and review. 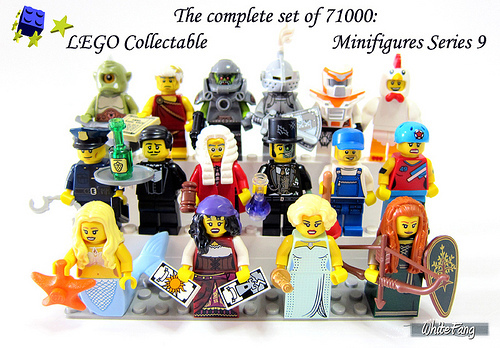 While the minifigs are scheduled for release in January 2013, Lego has sent a case to Eurobricks for an early review. From the review, I noticed that the case distribution is heavily skewed in this series so that there are only 2 copies of certain minifigs and up to 6 of others in 1 case. Is this an attempt to assign rarity to certain figs, and how will the consumers react? No skier or skateboarder? I call fake! Joking, joking, but seriously, so glad there are no skiers or skateboarders. I will be very disappointed if the distribution seen in the review is what we end up with. I purchase a box so that I can get three complete sets. Plus what is army builder for someone is a unwanted for others. How am I ever going to staff the restaurant to server all of the police officers that are going to be running around. What’s that ratio? Hopefully 2 each on the police, waiter, plumber and roller derby girl. I’m really digging the front and back row in the second picture, except for the chicken suit guy and maybe the white/orange power ranger looking dude. I think they would be dumb to try and make a more desirable fig less common. Big box stores are powerless to stop kids from feeling for their preferred fig, and Lego stores clearly don’t care. Having a less desirable fig clogging up bins would probably be a huge turnoff. Especially for the occasional parent who just grabs a handful and ends up giving their kid 10 of the same crappy fig. I wish they would just make the packs transparent. Woah! Holy crap, they actually made a series that I want ALL of. All! That’s terrific. I am terribly excited, but it looks like I won’t have long to wait! This series looks really good, I don’t know how much more my pocket book can take though! My first thought when I saw the Forest Maidens hair was Princes Leia on Endor after she met up with the Ewoks. Anybody with me on this? These. Look. Fantastic! Going to be an expensive year. Looks like it might be harder to collect this whole set. Lots of army building potential to get gobbled up quick. The Battle Mech doesn’t look pretty good… I guess it looks more like a custom figure than an actual LEGO thing. I mean, there’s too much printing on the armor.